Nikon D3, 16mm lens, 30 sec., f/2.8. Image is one of a series of star shots that made up a star trails image. This image, because it was shot in clear atmospheric conditions, allows the Milky Way to be seen. D3S, AF-S NIKKOR 14-24mm f/2.8G ED, 30 seconds, f/5.6, ISO 400, Matrix metering, auto white balance. This image was shot on the South Rim of the Grand Canyon, Arizona. I light painted the tree and snow for about 5 seconds. There are a variety of techniques that can be used to create dynamic photographs of the night sky, including capturing the stars as pinpoints of light, as star trails and by creating time-lapse movies of the stars as they move across the sky during the course of an evening. We spoke with three photographers—Pete Saloutos, Deborah Sandidge and Diana Robinson—to find out their techniques for great photos of the night sky. We also asked our in-house movie making guru and senior technical manager, Steve Heiner to give us tips for making great time lapse movies of the stars. “Enthusiasts of astrophotography may choose to invest in special equipment for tracking the stars as the earth moves,” explains Deborah. A telescope mount moves the camera/telescope as the earth rotates. This allows for long exposures of the night sky that will pick up the fainter light of the Milky Way for example. To photograph the stars in the sky as pinpoints of light, start with as wide an f/stop as your lens allows, and shutter speed of about 20 seconds. Any more time than that and the stars will begin to blur. Increase the ISO as needed for a good exposure. Diana says she’ll often let the foreground be lit by moon light on nights when the moon is bright enough because there is enough detail and light to add to the image. “On dark nights, I only light paint foreground elements when it makes artistic sense,” she says, noting that she tries to make the foreground look as natural as possible in most cases. There are two techniques Diana uses when photographing the moon and stars in one scene. At times, she will bracket the exposure and composite two frames together, so the final image will have both the moon and the stars properly exposed. Other times she’ll use multiple exposure to expose for the moon and stars separately. Using a wide-angle or fisheye lens, you can also incorporate the foreground into your images. 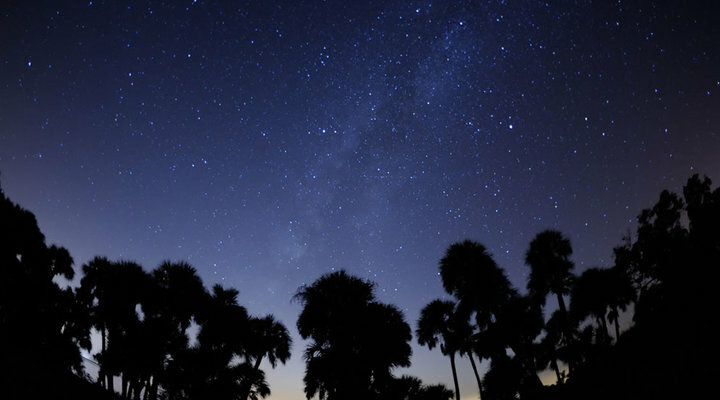 Depending upon the subject, the foreground as a silhouette may enhance the overall image, or detail in the foreground may complement the night sky. The foreground can also be lit using a variety of techniques. High Dynamic Range (HDR): One technique is to take multiple shots, bracketing or varying the actual exposure time, and merge them as HDR which you can composite with the final image of the properly exposed sky. Painting with Light is another technique that can be used if the foreground is close enough. There are two ways to paint with light: using a constant light source such as a flashlight or with a Speedlight. Constant light source: while the shutter is open, use a constant light source to illuminate the foreground. Move the light around during the entire exposure so you don’t end up with hot spots. Speedlights: while the shutter is open, press the Speedlight’s Flash button. As with the constant light, move the Speedlight across the scene to allow the flash to illuminate the entire foreground. And just because there are clouds in the sky doesn’t mean you need to stay indoors. The clouds can add an interesting aspect to night photography when they’re sparsely dotting the sky, allowing the stars to peek through. D4, 14-24mm f/2.8 lens, 25 sec., f/4, ISO 4000, Matrix metering, manual exposure. Speedlights with red and yellow gels manually "popped" to paint light onto foreground. D4, 14-24mm f/2.8 lens, 15 sec., f/5.6, ISO 12,800, Matrix metering, manual exposure. Speedlights with blue and yellow gels "popped" to illuminate the foreground and mid-ground areas. The Milky Way can be seen faintly in the sky near the top left of the image, and clouds at top right. D4, 14-24mm f/2.8 lens, 20 sec., f/2.8, ISO 4000, Matrix metering, manual exposure. Speedlights with blue gels manually "popped" to paint light onto foreground. The Milky Way can be seen in this image. D4, 14-24mm f/2.8 lens, 15 sec., f/5, ISO 12,800, Matrix metering, manual exposure. Speedlights with green gels manually "popped" to paint light onto foreground. The Milky Way is faintly visible near the top left/middle of the sky, among the clouds. Pete Saloutos creates unique, almost unworldly images of the night sky by incorporating the painting with light technique to illuminate the foreground. He uses Speedlights to paint with light, pressing the Flash button multiple times while the shutter is open during a long exposure, to "pop" light into the scene. Colored gels over the Speedlights add a uniqueness to these photographs, each of which are created from a single long exposure, with the camera recording NEF (RAW) files. Pete set the white balance on his D4 to daylight, and used an ISO range of 4,000 to 12,800 over the course of shooting at Joshua Tree National Park in California. Shutter speeds ranged from 15 to 25 seconds. Pete manually focused the camera on the closest trees in the foreground. "Its important to shoot during a new moon—when the moon is not visible in the night sky—to keep light to a minimum," Pete explained. He also decided on the location based on its distance from cities, to eliminate light pollution affecting the images. Nikon D4S, AF-S NIKKOR 14-24mm f/2.8G ED, f/4, ISO 800, 28 seconds, auto white balance. Stars Over Crazy Jug Point on the North Rim of the Grand Canyon, Arizona. Bowman Lake in Glacier National Park. This is a composite of two images, the light painted foreground and the stars. I set up the driftwood and stones in the foreground to add interest to the shot as the beach was pretty uninteresting without them. I light painted the foreground for about 15 seconds. I exposed the sky for about 35 seconds because I wanted to see the beginnings of some star movement to add interest in the sky. I used a longer exposure than I normally would have because I wanted to show the two kayakers in the right side of the frame. Everglades National Park. I was light painting the dwarf cypress trees near Rock Reef pass when I started driving west and noticed how the trees looked by the side of the road. Since it was late at night and no one else had driven past me on this road for hours, I set up my tripod low in the middle of the road. D3S, AF-S NIKKOR 14-24mm f/2.8G ED, 40 seconds, f/5.0, ISO 400, Matrix metering, auto white balance. I light painted the dwarf cypress trees and the road for about 15 seconds. D2X, 70-300mm f/4.5-5.6 lens, ISO 100, manual exposure, Matrix metering. Image Overlay technique was used to create this image in-camera: the moon was shot first (f/11, 1/50 sec. ), then the shack (f/11, 4 sec.). Photographing the moon along with the foreground landscape can be tricky because of the wide dynamic range. Exposing for the foreground might cause the moon to be overexposed, and exposing for the moon might cause the foreground to be too dark. In this case the optimum solution may be to create a multiple exposure or composite. Post-production composite: Another technique is to photograph the moon and the landscape as separate images and combine them together using an image-editing program. Use the same focal length lens that you shoot the landscape with, when you photograph the moon, for the most realistic look in the final composite. It also makes the actual compositing easier to do. If you’re using a wide-angle lens and the moon is a small element, it likely won’t cause the overall image to suffer if the moon is blown out with no visible details. Remember to use a shutter speed of about 1/15 second or faster since the moon actually moves pretty fast across the sky. Digital photography allows photographers the ability to use a lot of really cool techniques for capturing imagery—even the passing of time—by using time-lapse photography. Many of today’s Nikon digital cameras (DSLRs, Z series, Nikon 1 and COOLPIX models) feature an interval timer built-in. [Check your camera's manual to see if your model has this feature —editor] The interval timer controls the span of time between exposures and the total number of exposures made by the camera for an orderly recording of images over the timespan you want the time-lapse to cover. You choose the number of images to take, at specified intervals and the total period of time that you want the camera to shoot these images in. Some higher-end Nikon DSLR models incorporate a time release movie mode that takes care of processing the hundreds or thousands of individual exposures into a finished time lapse movie, right in the camera. Exposure starting point: Nikon’s Steve Heiner does quite a bit of time-lapse moviemaking—of varied subjects—including the stars traversing across the night sky. We asked him for suggested exposures to start off with. And, because digital cameras let you see what you just captured, you can double check the exposures and make quick adjustments on the fly. Shooting time-lapse sequences is similar to shooting a single image in that exposure is based on the shooting conditions. For time-lapse photography of the stars in the night sky, use an aperture of about f/5.6 if the moon is full, f/2.8 if the moon is not full. In manual exposure mode, shoot a test shot at 10 seconds. “I would always recommend using the manual exposure mode to avoid the exposure changing from one frame to the next which can cause an annoying flicker in the final time-lapse movie,” suggests Steve. Check the image by zooming in on the LCD, to see if you can see the stars and any detail in the foreground. Adjust ISO, aperture and shutter duration for a good overall exposure without letting the shutter speed go any slower than 20 seconds or so, otherwise you’ll end up with the stars beginning to streak into star trails due to the Earth’s movement. If you’re using a very wide-angle lens, slower shutter speeds may not be that noticeable, however you will see the streaking in images that are shot with a normal to telephoto lens. Turn ON the Long Exposure Noise Reduction feature to keep noise to a minimum. Other suggestions include not moving the camera or changing the exposure once you begin the time-lapse—and most importantly, the need for patience. Testing is important before you begin the interval shooting so you don’t end up disappointed when you get back to the computer. “I like to shoot my intervals closer than most photographers who shoot time-lapse for the first time. It makes the final movie much smoother,” he adds. Look for cool clear moonless nights (unless you specifically want to photograph the moon! ), and avoid light polluted areas (big cities or towns). Start with fresh, fully charged batteries. Use a sturdy tripod and cable release; set up your composition, lock down the focus, and make a test shot. This will help determine exposure, and if you need to make any changes to your composition. Shoot NEF (RAW) so you can more easily make adjustments in post-production if needed. Set the white balance between 2800°K-4000ºK. Check the histogram after you take the picture to make sure the image is being properly exposed. It’s easy to underexpose the stars or overexpose a foreground. Zoom in to the image on the LCD to check sharpness. Consider making a series of exposures for the foreground to merge as an HDR composite with the stars. A good starting exposure for most star shots is to use the widest aperture on your lens, expose for 20 seconds, increasing the ISO as needed for a good exposure. If you’re going out to specifically shoot the moon, research the phases of the moon, so you know what time the moon will be rising and setting each evening so you know when to plan your shoot. Also note the direction it will travel in the sky to plan your composition. Turn ON the camera’s Long Exposure Noise Reduction feature. To see more of Deborah Sandidge's photography, visit her website at www.deborahsandidge.com. To see more of Diana Robinson's photography, visit her website at www.dianarobinsonphotography.com. To see more of Pete Saloutos' photography, visit his website at www.petesaloutos.com.